The S.C. Vocational Rehabilitation Association (SCVRA) is a support organization for the VR, which prepares and assists eligible South Carolinian with disabilities to achieve and maintain competitive employment. John E. Batten, Esq. (left), accepts the Commissioner’s Medal of Excellence Award from VR Commissioner Neal Getsigner. John E. “Jeb” Batten, Esq., General Counsel for VR in West Columbia, received the Commissioner’s Medal of Excellence, the highest internal honor the department awards. Batten was recognized for his outstanding commitment and exceptional dedication to helping others. For 26 years he has provided guidance and advice to Agency executives and employees through all facets of the rehabilitation program and Disability Determination Services. 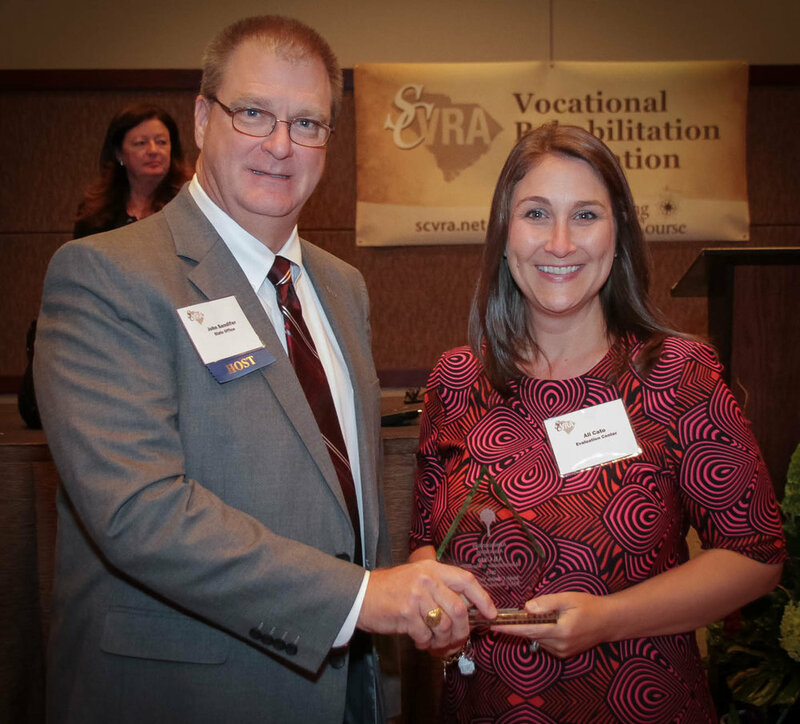 Ali Cato (right), Comprehensive Program Supervisor at the Evaluation Center in West Columbia, receives the Administrator of the Year award from the SCVRA Administrators Association from John Sandifer, SCVRAA President. 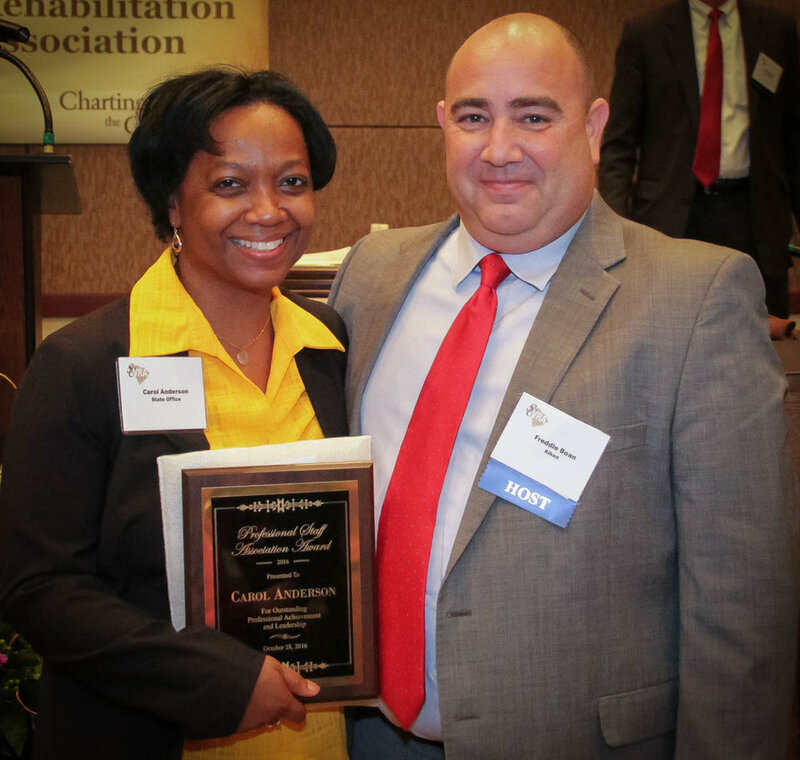 Ali Cato, Supervisor of the Evaluation Center in West Columbia, a comprehensive services facility, was named the Administrator of the Year by the SCVRA Administrators Association. Cato continually puts the needs of staff and clients at the forefront. Her hands-on approach and willingness to step in and help in whatever way needed ensures that VR clients receive exceptional service. She is also committed to helping staff grow professionally. 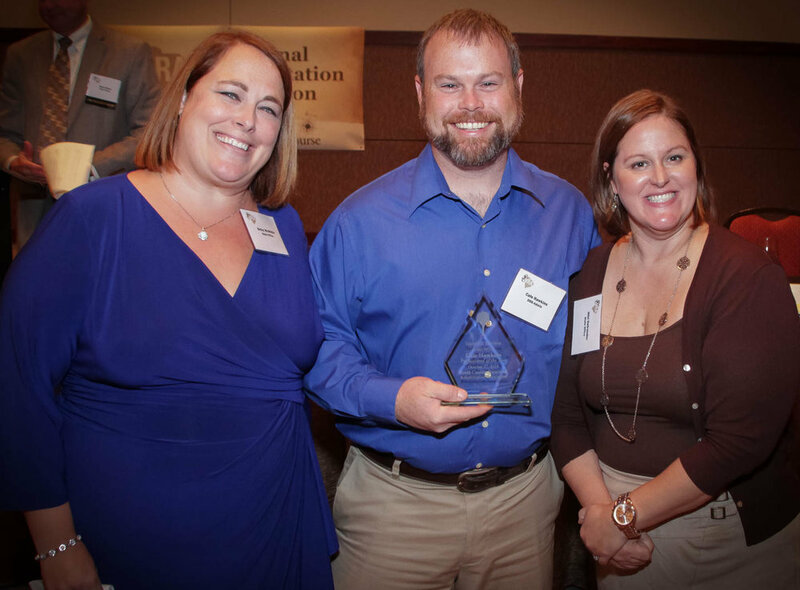 Cale Hawkings (center), Information Resource Specialist, accepts the Technical Services Association Award from Betsy McWhite (left) and Niki Ostrander. Cale Hawkins, Information Resource Specialist at the Disability Determination Services office in West Columbia, received the Technical Services Association Award. 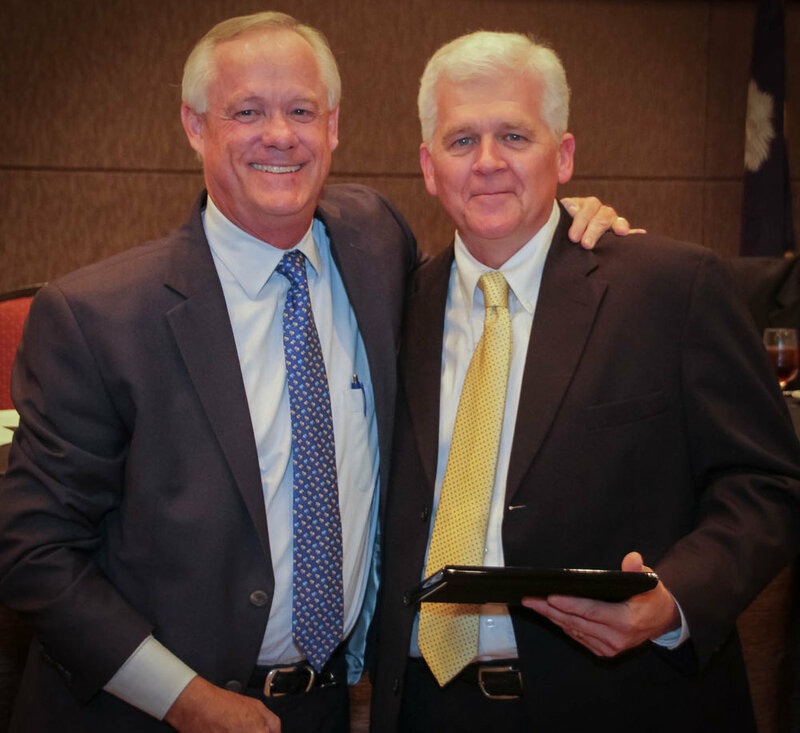 Hawkins was honored for his thoroughness, dedication, knowledge and leadership. Over the past thirteen years, he has been instrumental in the success of many large-scale DDS technology projects. Carol Anderson (left), Area Development Director, accepts the Professional Staff Association Award from Freddie Boan, PSA President. Miranda Craig (left), was recognized by her peers with the Direct Client Service Division award. Craig, Job Preparedness Instructor at the VR’s Conway Area Office, receives the award from Kerry Reece. Tara Jordan (right), Disability Determination Hearing Officer, accepts the Barry Cooper Award for Leadership from Yvonne Young, SC Association of Disability Evaluation Specialists President.